The Travel Channel and Stephen Leatherman, aka "Dr. Beach" have both called Poipu Beach one of America's best beaches. The Dr's list of best beaches is based on a rating system that includes such criteria as the makeup of its sand, its length, width at low tide, conditions for swimming and snorkeling, boogie boarding waves, its park and facilities and picnic areas, ease of access, appeal to a wide range of ages, etc. Others prefer Poipu because the weather seems better here than the rest of the island. When it's raining elsewhere on the island, Poipu is often sunnier. Still others prefer Poipu for less scientific reasons - it's just where everybody else is. Face it, a person can only take so much solitude and deserted beaches - eventually you want to see some people! In Hawaiian, poipu means crashing (as in crashing waves) although the beach is mostly protected from large wave action by a rock formation known as Nukumoi Point a few hundred feet offshore from the middle of the beach. A narrow sand spit known as a tombolo forms from the beach out to the point forming two back-to-back, perfectly formed crescents of sandy beach. The tombolo forms naturally due to wave action and currents but can disappear for years between appearances. After an absence of about 10 years its reformation in 2010 made local news. The eastern crescent beach ends in a shallow, semi-enclosed pool that is ideal for children and a manned lifeguard tower helps keep an eye on them. Surfers catch waves just beyond Nukumoi Point, but this isn't a surf break for beginners. Unless you're an expert, this might be a good place to watch and learn from the local experts. Poipu Beach Park is just behind the lifeguard tower and provides a large grassy expanse for Frisbee throwing, more sunbathing, picnic tables, barbecues, restrooms, and fresh water showers. The park also includes playground equipment providing even more entertainment for children. 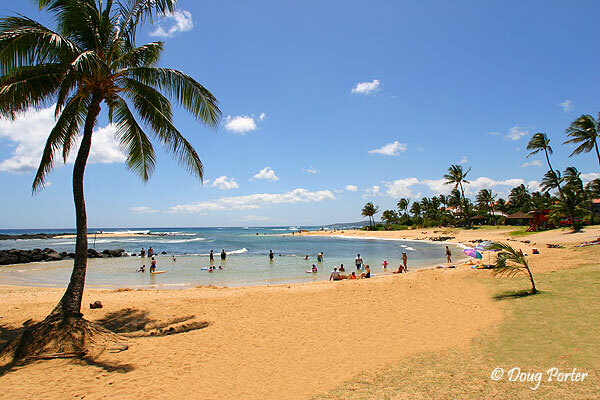 The beach and park are collectively known as Poipu Beach Park or just Poipu Beach. The entire area surrounding the beach and in a broader sense, just about everything south of Koloa is also known as Poipu. Poipu Beach is neighbor to several other beaches that offer more variety and fun. Brennecke Beach is just on the other side of the park and is the most popular boogie boarding beach on the island. Shipwreck Beach is further to the east and Kiahuna Beach is just to the west. All three are within easy walking distance from Poipu Beach. Brennecke's Beach Broiler, is across the street from the park along with a couple of shops and a convenience store with sunscreen, water, soft drinks and sandwich deli. Free parking is available along the street and in a couple of parking lots next to the restaurants and shops. Poipu is of course one of Kauai's most popular tourist destinations and several south shore Kauai vacation rentals are along the coast. The Grand Hyatt Kauai Resort is just a little over a mile away to the east and the Sheraton Kauai is just a short walk down the beach to the west beyond Kiahuna Plantation. Several condominiums resorts, including Poipu Shores, Poipu Kai Resort and Sunset Kahili offer vacation rentals next to Poipu Beach. Kuhio Shores Condos and Prince Kuhio Condos are less than two miles along the coast to the east. 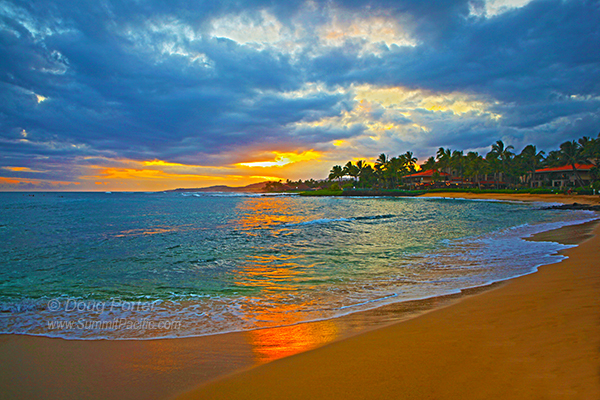 See even more beautiful Kauai Beaches.